MOVIE REVIEW: Tropic Thunder: Apocalypse When? 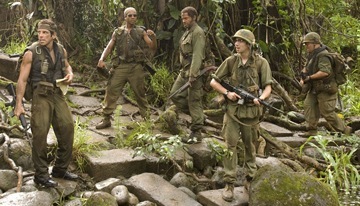 Tropic Thunder may well be the most [deliberately] politically incorrect film I’ve ever seen – and one of the funniest. The fake trailers alone are worth the price of admission! Ben Stiller’s film takes aim at every level of Hollyweird culture, from trailers to fraudulent writers to explosive studio executives – and is on target far more often than not. When the writer of a book about the Vietnamese War [Nick Nolte] suggests that a first-time director [Steve Coogan] send his actors into the jungle – which has been seeded with cameras and various practical effects [explosions, gunfire and the like] – the cast members find themselves mixed up with a heroin cartel headed by a twelve-year warlord [Brandon Soo Hoo]. The actors are a truly motley assemblage of stereotypes: Tugg Speedman [Ben Stiller] the action star seeking legitimacy; Jeff Portnoy [Jack Black], star of the Fatties franchise and drug addict, also seeking legitimacy; Alpa Chino [Brandon T. Jackson], a rapper breaking into the acting game; Kevin Sandusky [Jay Baruchel], an actor in his first big movie, and Kirk Lazarus [Robert Downey Jr.], an Australian actor with multiple Oscars, who has his skin darkens to play a black character. None of them really has much of a clue, which leads to explosive ranting by studio head Les Grossman [a virtually unrecognizable Tom Cruise]. Stiller’s direction is pretty much on the money as his movie-within-a-movie allows him to show Hollywood at both its strangest and its worst. When we see the trailer for Simple Jack, for example, we aren’t seeing an attack on the mentally handicapped – unless we’re looking at Tugg Speedman for playing a mentally handicapped man solely to win an Oscar – or Kirk Lazarus for explaining, in a very funny bit, why simple Jack didn’t work. And speaking of trailers, the fake trailers that open the film are spot on satires of specific genre trailers, and are among the funniest moments in the film. Other highlights include black rapper Alpa Chino keeping Lazarus honest as he plays a black character, even while he [Chino, that is] tries to flog his line of merchandise on camera; Coogan’s director, Damien Cockburn, taking charge; Speedman using what he’s learned from Lazarus to wow his captors in a live, less-than-no-budget performance; that the film becomes a big honkin’ war movie even as it satirizes the culture that creates an Apocalypse Now; Matthew McConaughey’s turn as Speedman’s TiVo-obsessed agent, and Danny McBride who steals every scene he’s in as the film’s special effects expert, Cody. Tropic Thunder may be the best film Ben Stiller has ever made. It’s loud and crass, joyously politically incorrect, and well under two hours and gives us all the action of movies thirty minutes longer. In a summer that has had a number of good comedies, Tropic Thunder literally blasts its way to the next level. on the back of the napkin.